One in four Brits is secretly holding on to something which reminds them of an ex, a study has found. Despite their relationship being well and truly in the past, millions of sentimental people still have clothes, jewellery and other items belonging to an ex-boyfriend or girlfriend. But while most admit to keeping hold of something belonging to a previous partner because of the sentimental value, one in twenty admits to having it because it’s worth some money. And a fifth of adults have discovered items which belong to their current partner’s ex while tidying up at home, with one in twenty admitting it led to a row. The poll, by Safestore, also found a third of us have thrown out something we later wish we’d kept hold of. Psychologist, Dr Becky Spelman, said: “A teddy bear or toy from our childhood or an old gift from a teenage sweetheart is more than just a relic of an earlier time – it is an emotional gateway to our early years and all the people and things we loved back then. “Without our emotions and memories, we wouldn’t be who we are today, and all the keepsakes we have treasured are an essential part of that. “That’s why it is so difficult for many people to keep items to a minimum. “Many of us feel genuine grief, akin to that we feel when we lose a loved one, when we have to get rid of things that are precious to us, or that we associate with people we have loved. 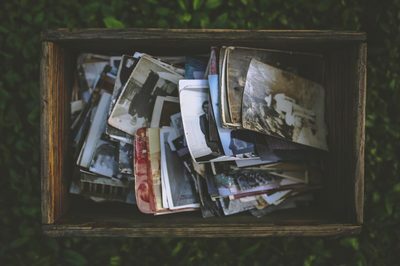 The study of 2,000 people found photographs and photo albums are the items we are most likely to keep hold of, followed by birthday and Christmas cards from family and friends and heirlooms. Paintings and drawings from our children and old school reports and books, both from our own childhood and our children are also among the things we can’t bear to throw away. Some even admitted to holding onto things which don’t even work anymore and old underwear for the memories. It also emerged almost two thirds of Brits have a place in their house dedicated to keeping the things they can’t bring themselves to throw away. But coming across treasured items typically makes us feel happy and reminds them of who they are yet we are often pressured to get rid of things despite the strength of our attachment to it. As a result, more than half of us regret throwing away sentimental items in order to declutter our home with childhood things most likely to be missed. Others have regretted getting rid of collectibles, items associated with previous hobbies and old photo albums. Forty-eight per cent also wish their parents had kept more of their belongings so that they could be passed on. Psychologist, Dr Becky Spelman added: “It can be tempting to get rid of things as we move house, or as our home becomes cluttered, but there can be real and lasting emotional consequences for throwing out belongings that might one day be treasured. “Many of us love having the opportunity to hold and own things that once belonged to our grandparents or great-grandparents, even if they have little or no monetary value. Dave Cox, storage expert at Safestore, said: “The variety of ‘stuff’ that is brought into our storage centres is just incredible – from rare collections to unusual relics, it’s why programmes like Storage Hunters are so popular.